If you are unable to visit our gallery and would like to purchase photographs from this preview or others in the gallery, please contact the gallery and call 585-271-2540. As a native New Yorker, the depth in photographing certain parts of the city’s landscape always amazes me. 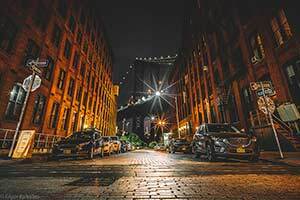 One specific location that continues to be an iconic place to photograph is a place known as Dumbo in Downtown Brooklyn. Dumbo is an acronym for Down Under Manhattan Bridge Overpass. Although this specific spot, which frames and highlights the Manhattan Bridge, has been photographed many times, I wanted to provide my own interpretation of Dumbo. The challenge of this location is trying to avoid the daily massive crowds of tourists and photographers that camp at this spot for hours. Luckily, I was able to find a specific time of tranquility during a very hot and humid summer evening at about 1:30 in the morning. With this image, I decided to take a bottom-up approach to the shot in order to create a more unique perspective. Also, as a fan of long -exposure nighttime photography, I love how light bursts become essential pieces to the composition. Michael has been passionate about photography for 50 years, from working full-time at a photo studio in Boston, learning the essentials of image capture and film printing, to shooting digital black & white images of work that is landscape, architectural and abstract oriented today. 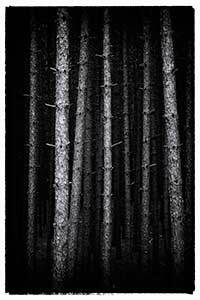 As may be seen in Pines #2 - Maine 2015, his objective is to capture and print ‘interesting’ subject matter that invites the viewer to become engaged with the image in discerning what one is actually looking at, and how the image was photographed, modified and printed. Pines was taken on a road trip, north of Portland, Maine in early October 2015 in late morning with an heavy overcast sky and taken with a Nikon D810 camera with a lens at 70 mm, ISO 3200, f18, 1/125. Using a photoshop workflow process he developed over the years, he printed it with an Epson Stylus Pro7600 printer, on Red River Art Natural paper. Sometimes, when you look up, you can see beautiful and interesting things! 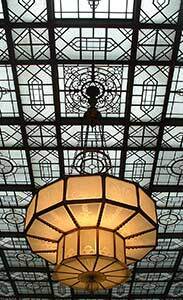 For decades I have been drawn to the geometric patterns in the ceiling/skylight at Rundel Library. My goal was to capture the point of suspension, the drop, and the angles of the light fixture itself without any non-skylight matter on the left and right sides. To do this, I took the photo lying on the ground so that I could maximize the distance between myself and the subject. Then I zoomed in just enough to get rid of some distractions on each side. If only the skylight was a little wider so that I could have gotten just a little more ceiling showing on the bottom of the photo! The ceiling is such a stunning architectural piece! The more you zoom in on the digital file, the more detailed patterns you can see in both the skylight and the light fixture. On your next visit to Rundel Library…be sure to look up! Thank you to Image City Gallery for sponsoring The Magic of Light show, to all my crazy friends and family who voted for my photo, and to Lumiere Photo for the gift certificate! Photography is almost always thought of as a two-dimensional art form, with the third dimension suggested by the interplay of shadows with the subjects and a decrease in apparent size as the subjects moves back into the plane of the image, farther from the viewer. Medieval paintings were without perspective….. everything looked flat. Then as we moved towards the Renaissance, painters started to use their skills to show perspective, a three dimensionality on a two-dimensional surface. Scott has taken this one step further, as his photographs shown in this wonderful display, actually have a third dimension! He achieves this by having several actual photographic layers which are skillfully cut to show real depth. This photograph is an excellent example of the skill that Scott brings to his work, as it is not merely a “gimmick” which could be the result of a lesser photographer. The eye is guided from the earthy colored steps in the foreground to the beautiful church in the background, offering a strong contrast between the common and the spiritual world. The church shows the rich blue color along with glimpses of religious paintings. 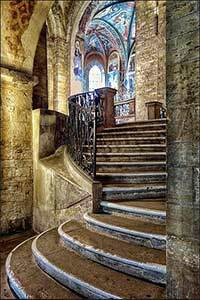 The viewer almost wants to climb the steps and enter this church and enjoy its majesty. The finish of all of the work on display is impeccable, showing strong craftsmanship not only in the composition but in how the layers are selected and prepared to show the third dimension.